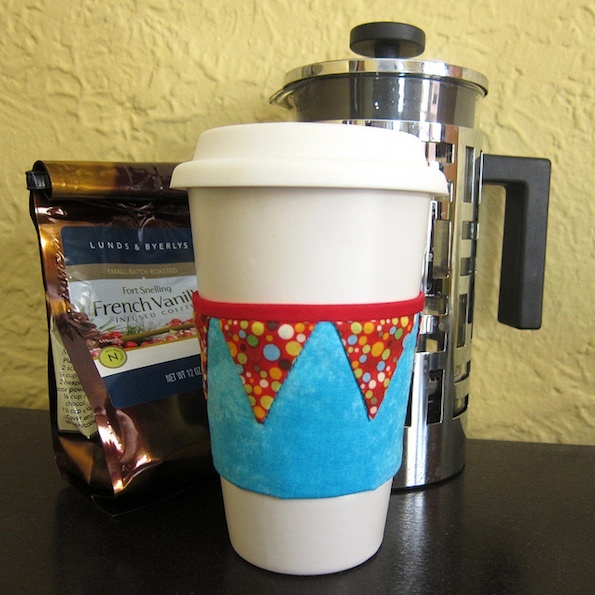 This week’s Iron Craft challenge was to make a coffee sleeve or cozy. I’m a big fan of reusable coffee sleeves, it just makes me cringe to take those cardboard ones as often as I get coffee out. 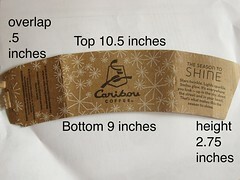 (Yeah, I’m addicted to Caribou’s spicy mochas.) Last year I knit up quite a few sleeves so, I decided to try something different this time & did a quilted one. Last week’s challenge was bunting & I really wanted to make a bunting quilt but, a week just wasn’t enough time. This challenge seemed like the perfect way to make a tiny bunting quilt. It’s also a great way to use up scrap fabric & batting (man, do I have a lot of scrap batting). I love the colors of these fabrics, they make me think of bright bunting fluttering against a blue summer sky. 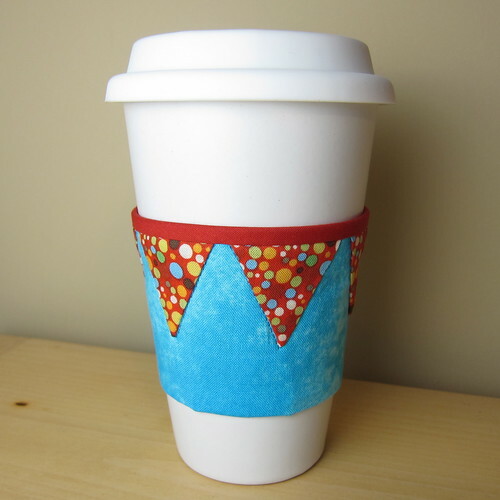 I used a cardboard sleeve from my local coffee shop as a pattern. 2. Cut two pieces of you background fabric using the sleeve as a guide again but, make it 1/4 inch wider on each side & longer on the bottom than the sleeve. 3. 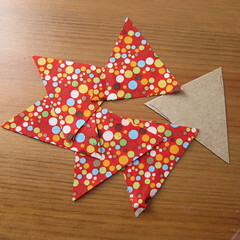 Cut out 5 triangles that are 2 inches wide at the top & 2 inches long. I made a cardboard template & traced around it to make this easy. Applique the bunting triangles on the background. 1. 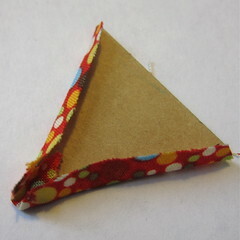 Cut your cardboard triangle template so it is 1/4 inch smaller on each side than your fabric triangles. It’ll be about 1.5 inches wide at the top & 1.75 inches long. 2. 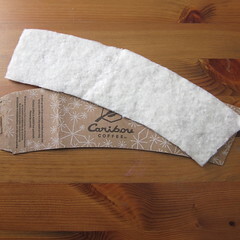 Use an iron to press the sides of the fabric triangles in over the cardboard template. At the point fold the fabric from the bottom up & then the fabric from the sides over that. 3. 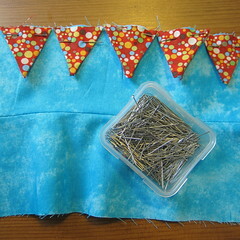 Pin the triangles on to the top of one pieces of the background fabric. 4. 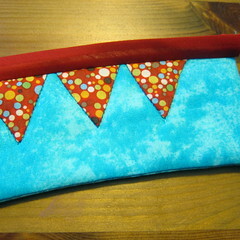 Sew the triangles on with matching thread using a blind stitch. 5. I then used thread that matched the background & quilted around each flag on my sewing machine. 1. Sew the background pieces, right-sides together, along the bottom using a 1/4 inch seam allowance. 2. Clip the seam & press open. 3. Sew the two side seams, right-sides together, using a 1/4 inch seam allowance. Trim the corners. 5. Insert the batting into the sleeve. You may need to trim it a little. 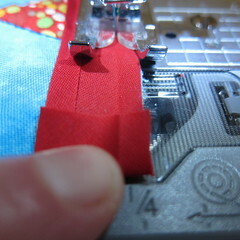 Sew on the bias tape. 1. Fold open one side of the bias tape & line the raw edge up to the top edge of the front of the sleeve. 2. 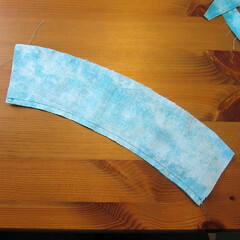 Fold in the ends so they are just a little longer the the sleeve. 3. Using your sewing machine or by hand sew along the fold line. This also sews the ends in. 4. 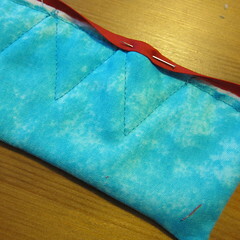 Fold the tape over to the back & blind stitch the folded edge along the sewing line you just made. 5. I also sewed the ends shut at the same time. You can either sew the sleeve into a circle with about a 1/4 inch overlap using a blind stitch on the inside & outside or add velcro to close it. Put in your car so you’ll have it every time you head to the coffee shop. This looks great. Good job! I LOVE this. Love it SO much! Very cute – buntings are so big right now, but this might be my favorite use to date!